Jurnii RV rental Colorado is the best way to discover the many highlights this state has to offer. Experience the freedom and flexibility your rv rental in Colorado will give you and book your rv vacation today. RV rental Colorado is a popular option for many visitors to the US. It is a state that offers a wealth of things to do and see, pleasing tourists year after year without fail. Situated in the Rocky Mountain region of the United States, this state is well known for its magnificent scenery, mountains, rivers, lakes and plains. Colorado RV rentals are the ideal way to explore this beautiful state as it will give you the freedom to explore such cities as Denver and Colorado Springs. It will also transport you into another world in the Rio Grande National Forest and Rocky Mountain National Park. Colorado is a great place to visit for those seeking a holiday filled with the best nature has to offer, with a true mid-western atmosphere. Colorado RV Rental dealers can be found in locations across the state, with a central focus in the major cities of Denver, Commerce City and Colorado Springs. Big names such as Road Bear and Cruise America can be found here, offering great deals on Colorado RV rentals. Colorado RV rental is a popular way to see this amazing state and its natural highlights. The freedom a campervan will give you to explore wonders such as the Rocky Mountain National Park will make your holiday a memorable and enjoyable one. Centrally located, just ten minutes east of downtown Denver, the botanical gardens offer a pleasant escape from the hustle and bustle of the city. These beautiful gardens strive to entertain and delight, while sparking the collective wisdom of the gardens through outreach, collaboration and education. The gardens here are so magnificent in fact that the plant collections have been classed as an accredited museum by the American Association of Museums. The collections of plants here will simply take your breath away as there is activity throughout the entire year, ensuring you do not miss out. 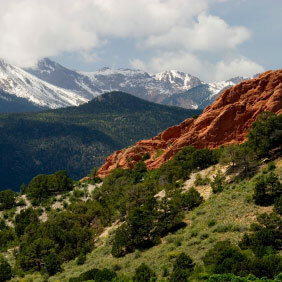 The majestic Garden of the Gods is nestled on 1,360 acres of prime land and is a truly breathtaking area. The gardens are full of weird and surreal red sandstone rock formations that rise in a God-like manner, giving the gardens their unique name. Accompany this with 300 degree views of towering sandstone rock formations against a backdrop or snow-capped Pike's Peak and awe-inspiring blue skies and you have one of the country's most beautiful sights. This stunning National Park is located in the north-central region of the state. Home to a wide variety of wildlife, this park boasts stunning scenic views, beautiful wooded forests, and imposing mountain landscapes. Perfect for bushwalking and camping, the Rocky Mountain National Park is a popular place for Colorado RV renters all year round.